Trouble is lurking outside the Clearview Elementary School. The blundering Captain Bumbo and his goofy pirate crew have spied what just may be a chest full of treasure sitting in the library, and they’ll do anything to get their hands on it—even if that means capturing Mrs. Finch, the librarian! But Captain Bumbo doesn’t count on the one thing standing in his way—a group of savvy students who arrive in the library to do research. The students are determined to carry out their task, and they even enlist the pirates’ help. Not surprisingly, Captain Bumbo and his crew are clueless about how to conduct proper research, and the students are shocked by their unethical recommendations. Will the silly Pirates of Plagiarism ever learn? 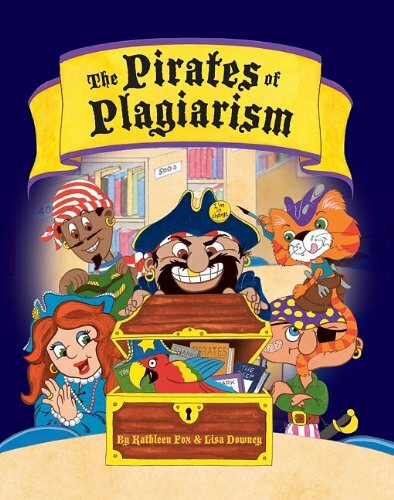 In this hilarious introduction to plagiarism, readers will ultimately discover that when it comes to real treasure, there is an awful lot of it right in their own minds!